All of us get invited to parties and events. If the hosts know you are a photographer, they may think, "Hey, he’s got a nice camera, let's ask him to take some photos." I see quite a few photographers at events with their flash units on top of their cameras with the latest modifier on it. I always chuckle a bit because I've always hated how those photos look. They're mostly the "Everyone say cheese" variety. Instead, go without a flash and use the available light in the venue. Sure, it may be horrid, dark or yellow or green, but make do with what you've got. Look for authentic expressions and interactions.... Pump up your ISO, take it off Auto and look for a story. let it happen organically. Light, expression, environment. Congratulations to the winner of the Ready for Anything Giveaway! Congratulations to Ron Veiner, the winner of our LumiQuest Ready for Anything Giveaway! Ron won the Ready for Anything kit, so he’s getting the ProMax system, (including the 80/20 ceiling bounce), the FXtra gel holder system, and the Ultra Strap, all in a lightweight storage wallet. Bummed you didn’t win? We’re a LumiQuest authorized dealer, so visit our site and you can get Ready for Anything too! The Ready for Anything kit from LumiQuest! "I only use natural light..."
Yup I remember saying that very same thing in an intentionally arrogant tone. Truth be told, I didn't know how to use artificial light whether it was from a strobe or hand held flash. Sure I had dabbled with them, but didn't understand the first thing about using either very well. I began my photographic journey doing street shooting. No artificial light, no reflectors, no scrims, just what being in the right place at the right time had put before me. After that initial fear of shooting strangers going about their daily lives wore off, street shooting became invigorating. Looking for the 'right' person, in the 'right' situation, in the 'right' light meant being visually vigilant and above all being patient. To this day it is still my favorite type of photography, but I've been both blessed and cursed to not have the time to pursue it as often as I have in the past. So for the next couple posts, I want to talk about shooting tips in natural light whether you're street shooting or creating a portrait. I have developed my own rule for shooting whether by natural or artificial light. I call it "The LEE" principle: Light, Expression, Environment. Make sure your image tells a story either using light, expression or the environment and you're on your way, but your best shots will incorporate all three factors. Let’s look at the LEE principle in available light/street shooting. 1. Tell a story, including the environment is as important as your subject. If you frame too tight, you lose the story in the shot. If you want to go in tight you can always crop, but try to get the entire story in camera. Park yourself in an interesting place and WAIT. approaching the bus stop, so I simply waited until he got into a position where I could frame him with the art across the street. Light, expression, environment. 2. Observe the light and determine what you hope to achieve before taking a shot. 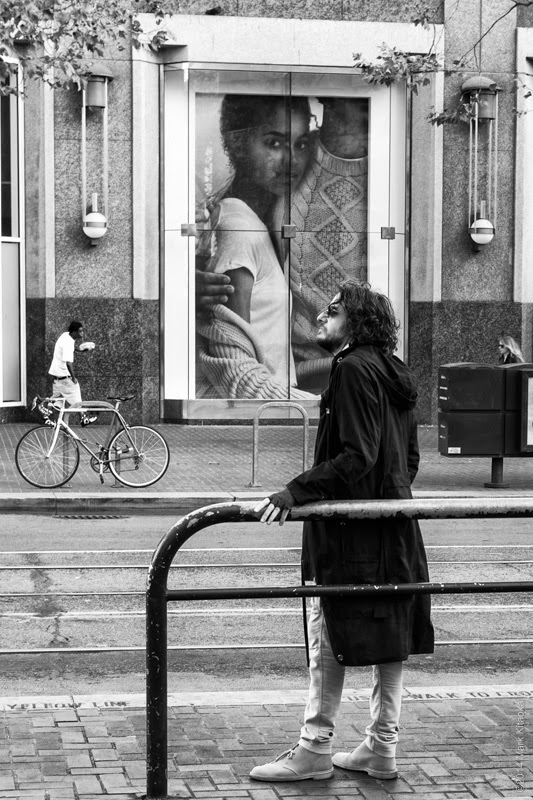 For this image I went into San Francisco one Saturday morning and waited as I watched people crossing California Avenue on Kearny Street. 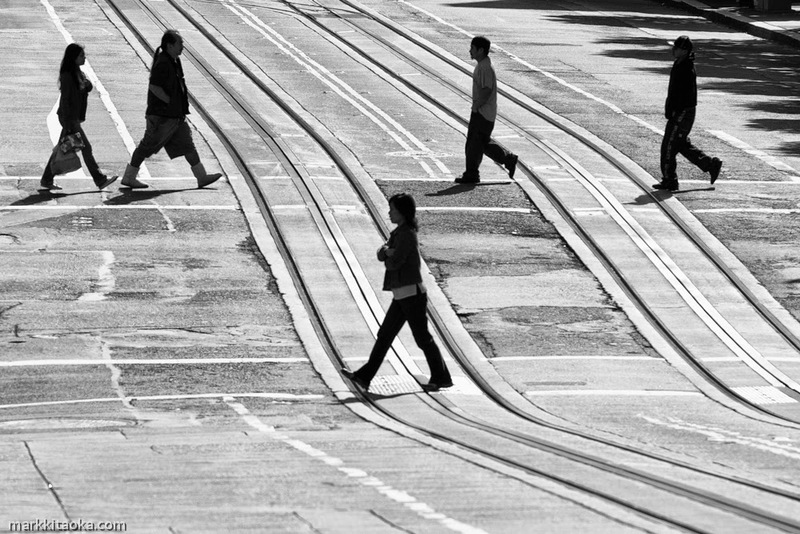 I waited until I observed these five people walking and snapped the image as they were in this formation. It was almost noon so I knew the subjects would be silhouetted, but that was my plan for this shot. Light, expression, environment. 3. Wait for the right action or expression. Remember a great expression with bad light or a boring environment will not get you the shot you want. 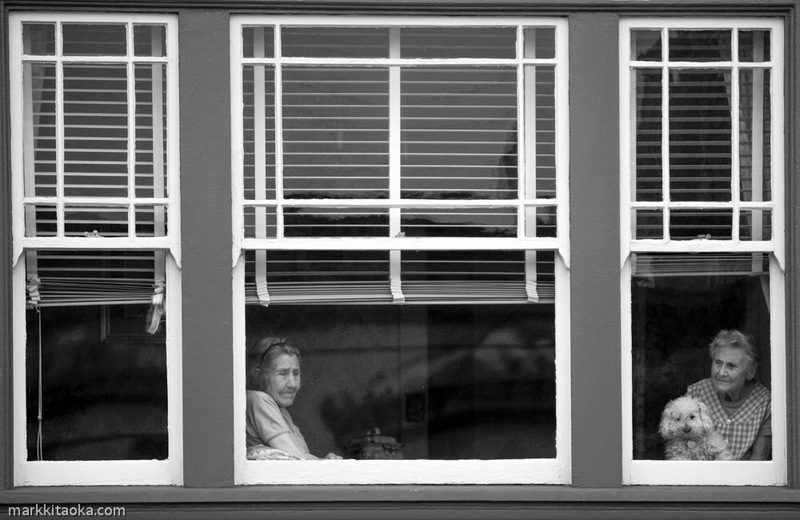 Window shots are my favorites and this one was taken during a street fair. I had to wait 15 minutes for the sun to travel to an angle to light the two women and the dog as they watched the people in the fair below their apartment. I was quite worried that this shot would be missed if they moved from the window. But I waited until the sun was just right and took this shot. Light, expression, environment. I literally HATE any time in the early morning. So getting up before 11:00AM takes an act of Congress or the potential for gorgeous light. In this case the two models in this photo were simply asked to run through a field of grass at around 7:00am amid gorgeous fog. When the light is diffused like this, the whole world seems gorgeous. Because the environment and light are almost a sure thing, your direction to the subject for expression and activity will make or break your shot. Light/expression/environment. Bodies of water make incredible reflectors! In this shot I had the subject in a rowboat and asked her to row parallel to the sun. I wanted her backlit to give an angelic feeling to the image. I asked a fellow photographer to spray water from a garden hose into the air and spot metered on her hair to give me the exposure I needed for the light. Light/expression/environment. My friend Russell was dismantling the recording studio he had operated for over 30 years. He asked me to photograph the process so he could have memories of his decades of recording so many artists. 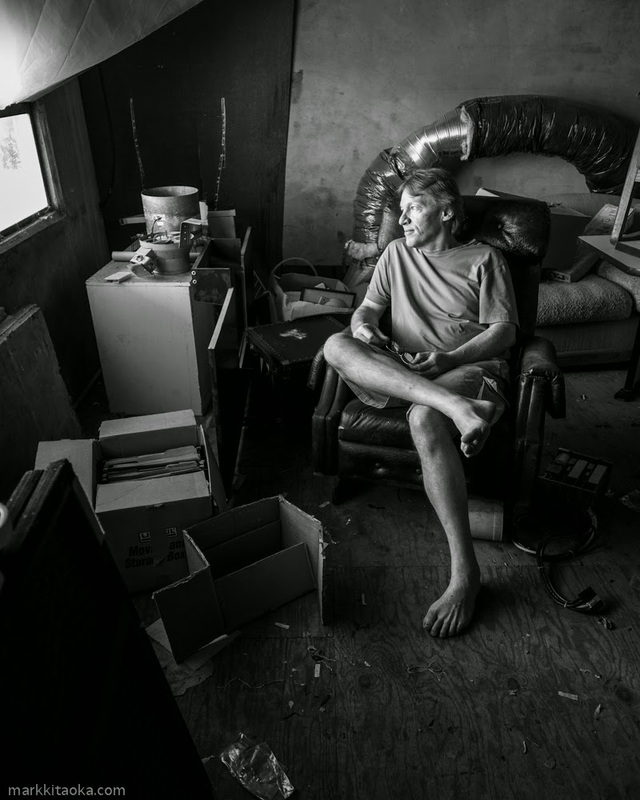 I told him that the story would not be complete without taking an environmental portrait of him, so I wandered around his studio to find the right spot. In his upstairs storage room was an old chair surrounded by lots of gear being packed and was lit by window light. Light/expression/environment. In the next two installments, I'll talk about natural light in event shooting and reflectors. Happy Shooting! 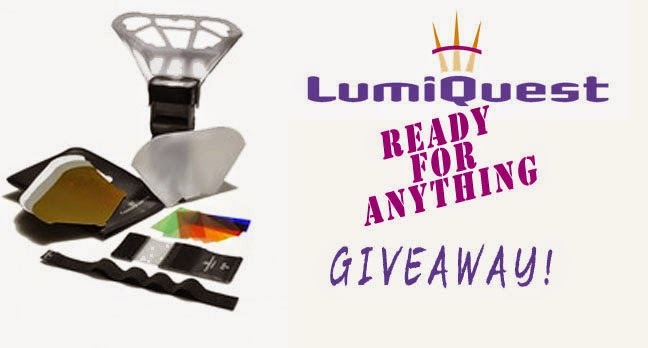 Enter the Ready for Anything Giveaway from SDC and Lumiquest! “Be prepared.” That’s not just a motto, they’re words to live by! But if you’re a photographer, being ready for anything could mean a confusing and expensive array of gear and accessories. 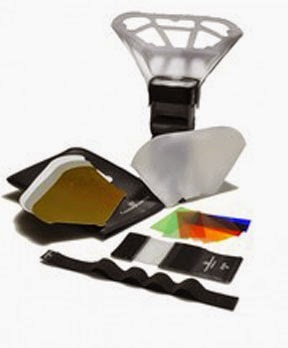 Check out the Lumiquest Ready For Anything Kit! This compact and efficient kit contains the ProMax system, a 6 piece set up that is built around the “80/20” bounce and also includes the Fxtra, a gel holder with an assortment of gels to balance your flash and the Ultra Strap which can be used with the kit as well as to securely attach photographic anything to anything else! You can win this kit, valued at $90, by entering the Ready for Anything Giveaway on our Facebook page! We're a Lumiquest authorized dealer, which means we carry the full line of Lumiquest products on our site. Never worry you won’t be prepared for whatever kind of light you encounter on a shoot; with LumiQuest’s Ready For Anything kit, you’re covered!